Gunman opens fire at two New Zealand mosques, killing 49. 1. Pallas square Nodes, and Pluto, ruled by Venus which is sextile/parallel Ceres. 2. Uranus and Saturn, rulers of Venus in aspect (semisquare/sextile) to Neptune. I'm looking at treating Ceres as analogous to Pluto in these charts. 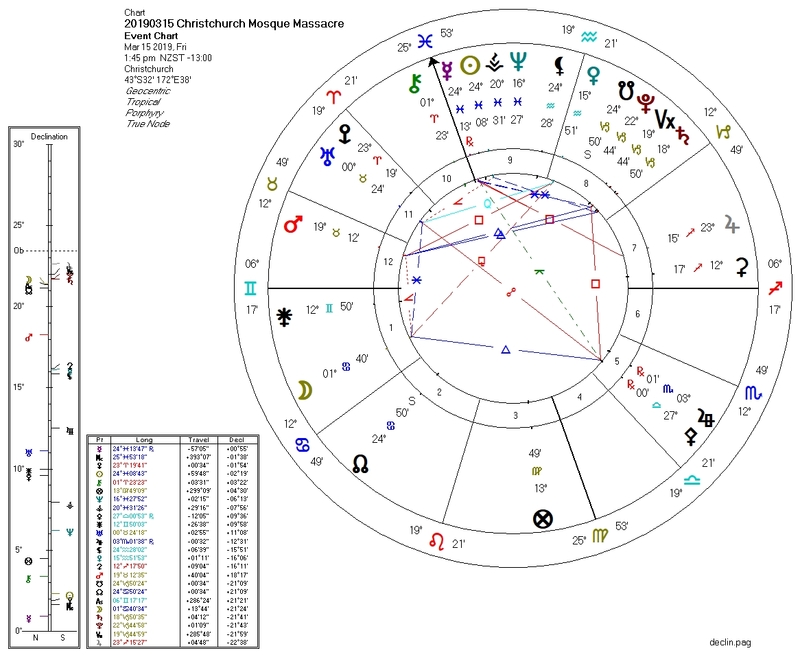 This event was coincident with numerous lesser-reported violent events, and so it is reasonable to expect a very strong Bloodbath Formula from the chart -- but the Pluto aspects are not as strong as I would expect. Treating Ceres as having a Plutonic effect gives this Bloodbath Formula the strength I would expect from violence of this magnitude.